The National Board of Chiropractic Examiners (NBCE) recently held their 11th Annual Student Leadership Forum. 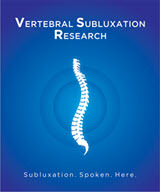 According to the International Federation of Chiropractors and Organizations (IFCO) and Sherman College of Chiropractic, their student leadership was not invited to attend. The NBCE has a history of leaving out student groups that it does not consider mainstream within the profession going so far as demanding that student groups that wish to be involved turn over their membership rolls, structure of the organization, number of chapters, and number of members to them. 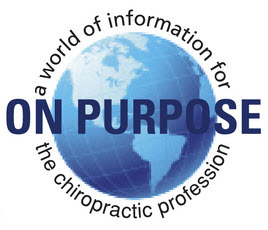 The NBCE is part of the Summit Group of chiropractic trade organizations, schools and corporations which has as its mission expanding the role of chiropractors as physicians. 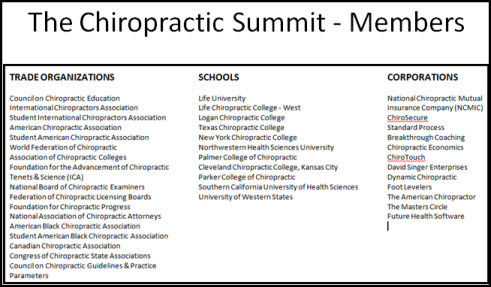 The Summit is also heaily focused on third party pay and all organizations and schools in the Summit embrace chiropractic as the practice of primary care. 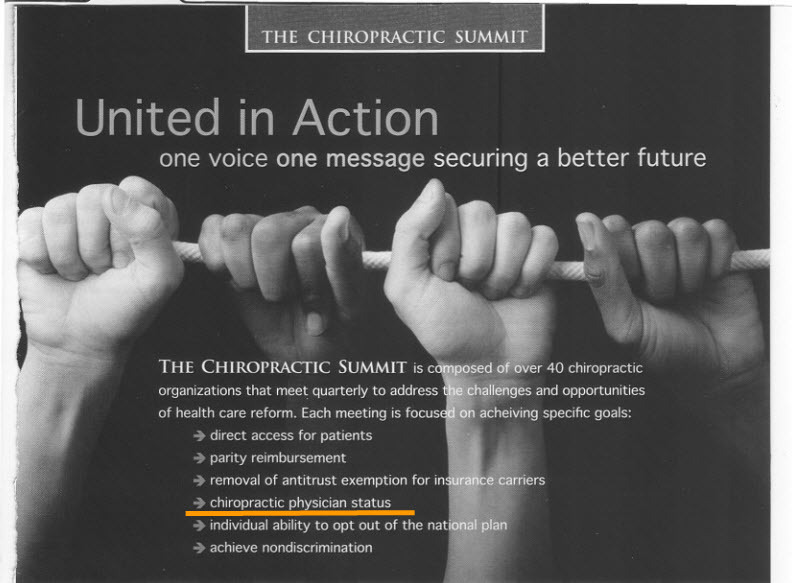 Many of the Summit members are thought to be a part of the Chiropractic Cartel operating within the profession. The IFCO and Sherman College are not members of the Summit Group. While you might wonder what "preconceived notions" Ouzts is referring to, the NBCE actually has a sorid history when it comes to its management, financial dealings and its relationship to other members of the Summit Group. "As in past years, the students were introduced to the foundations of NBCE testing, with special emphasis on explaining the relationship between the NBCE and state regulatory boards, the cost of exams and how these costs are set..."
"Dr. Leroy Otto, president of the Federation of Chiropractic Licensing Boards (and NBCE Director), also presented a short overview of that organization and its role in gathering and sharing information on regulatory matters." Dr. Otto serves on both the Board of Directors of the NBCE and is currently the President of the FCLB. 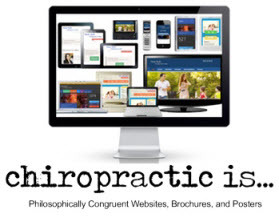 Otto also serves on the Minnesota Board of Chiropractic. Otto received nearly $10,000.00 for his service on the NBCE in 2011 and nearly $20,000.00 in 2012. Dr. Ouzts has received nearly $100,000.00 from the NBCE for his service as an NBCE director over the past five years. And, at least in the past several years, it does not appear uncommon for an NBCE Director to end up as Vice President and/or President of the FCLB and according to the NBCE website two directors are appointed by the Federation of Chiropractic Licensing Boards. NBCE's current President, Ouzts, is a former District Director for FCLB. The past four FCLB Presidents were all Directors for the NBCE. More interesting is that they do not resign their appointments in either organization when promoted. These amounts represented over 70% of the FCLB revenue each year. The FCLB and NBCE share more than Directors, Officers and money. The FCLB offices are only 207 feet from the NBCE offices and tax records show the NBCE provides lease of facilities in the amount of $35,607.00 to the FCLB. In fact, the FCLB seems to keep its eye on NBCE revenue as shown by recent FCLB Board meeting minutes. Such support appears to go back to at least 2006. In its January 2013 minutes the FCLB noted "...past support from NBCE in the form of conference shared expenses. 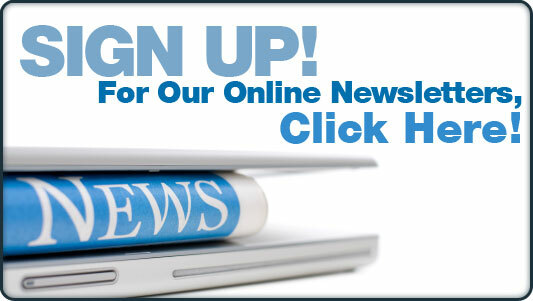 FCLB waives approximately 20 NBCE conference registrations". 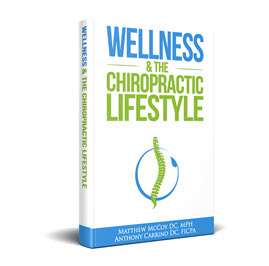 The NBCE had revenue of nearly $50,000,000.00 (Fifty Million Dollars) over the past five years which appears to derive directly from its testing of students enrolled in chiropractic colleges. Some have questioned how much of that money is coming from student loans which then goes to the NBCE and makes up 70% of the revenue of the FCLB whose mission is to assist state regulatory boards. In order to understand the significance of the relationship between the NBCE and the FCLB, it is important to understand the relationship between the NBCE, FCLB and the Council on Chiropractic Education (CCE). When the CCE finally won Department of Education recognition as the profession's only accrediting agency in 1974, the CCE admonished the FCLB to change the laws in each state to require graduation from a CCE accredited school in order to get a license. 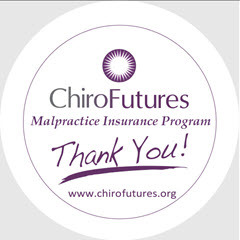 The FCLB was successful in accomplishing this and today the NBCE, CCE and FCLB have a monopoly control over the educational and licensing functions of the entire chiropractic profession. It is not known if any of the student leaders attending the NBCE Student Leadership Forum asked the NBCE or the FCLB about their financial and governance relationships.